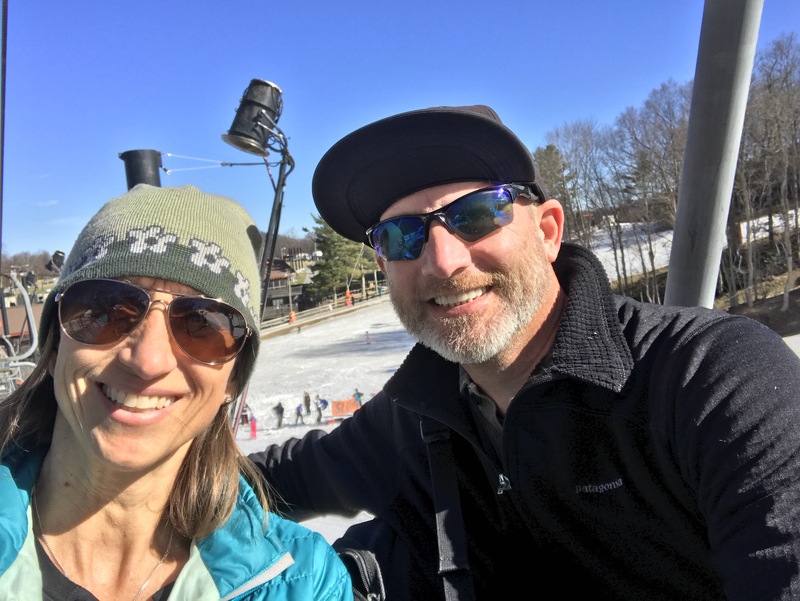 Yesterday we took a field trip to Appalachian Ski Mountain near Blowing Rock, NC. 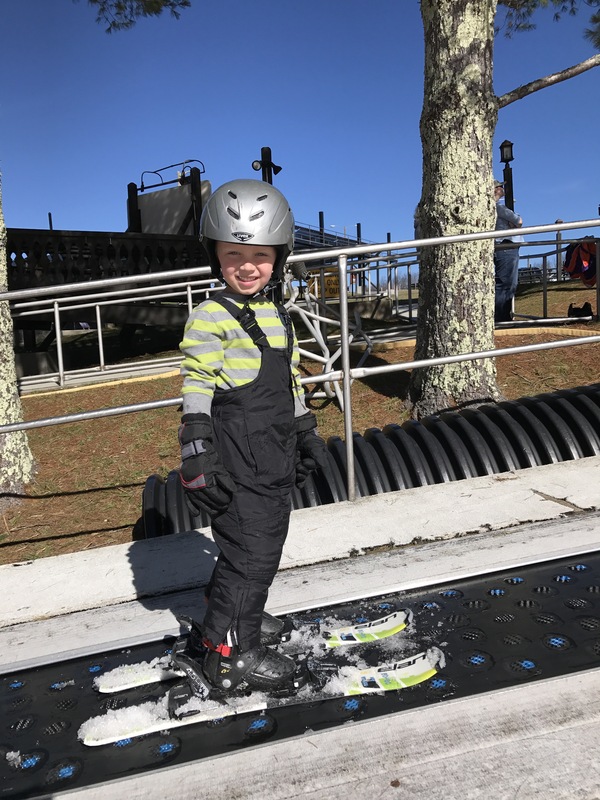 The ski slope has homeschool days on certain Wednesday and Thursday’s during the winter. 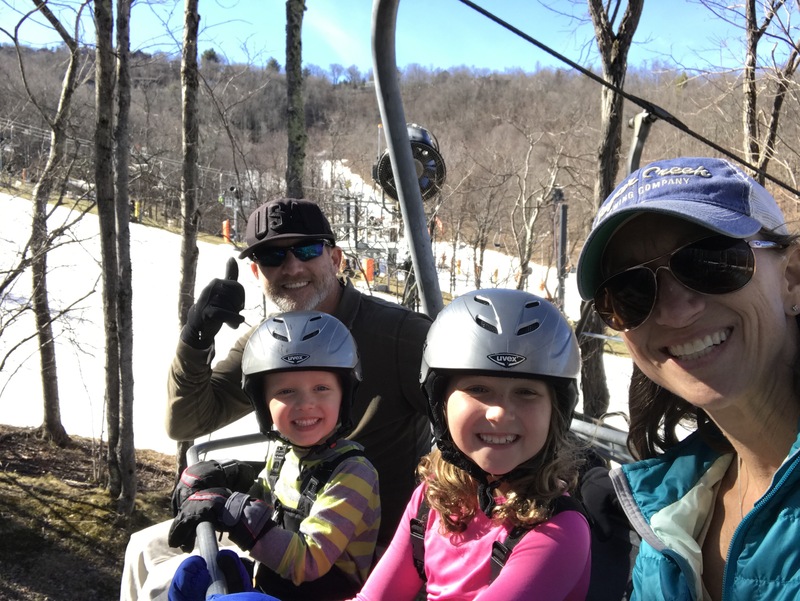 On these days skiing is very affordable and each greatly reduced ticket includes a one hour lesson and rentals. Love it! The kids had never been on skis before and they were just as excited as Tom and I were about them learning. 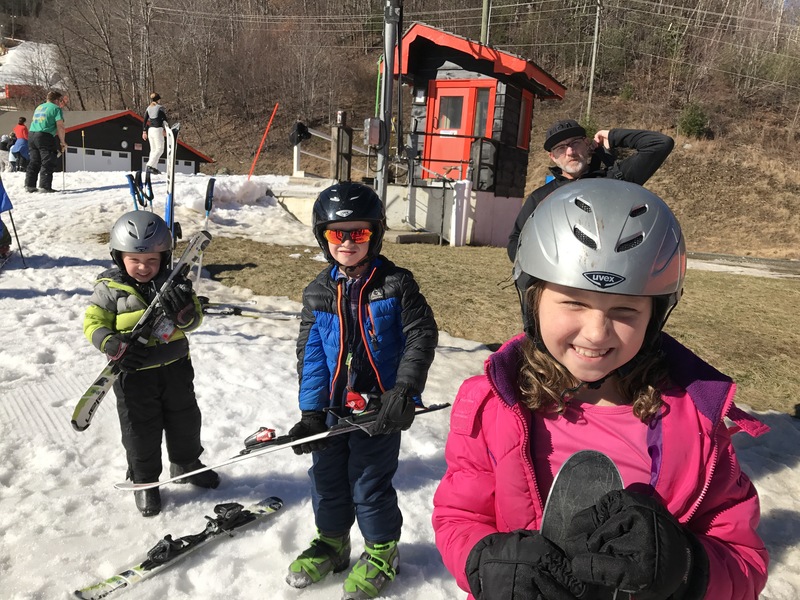 We arrived in just enough time to get the kids their tickets, suit them up and get them out to the bunny hill for their first lesson. As you can see, there hasn’t been a lot of snow here in NC this winter. The snow was only on the 4-5 runs that they had open. It has been cold enough to make snow at night, but that is about all they had. Yesterday it was so warm out that none of us even wore a jacket. It was 50 degrees or more and the poor kids were seriously sweaty after their lesson. About five minutes into the lesson, Tom and I had the realization that we had an hour free without children. We quickly went to rent our own equipment and were able to get in five or more runs before the kids’ class was over. The runs were super short but enjoyable just the same. 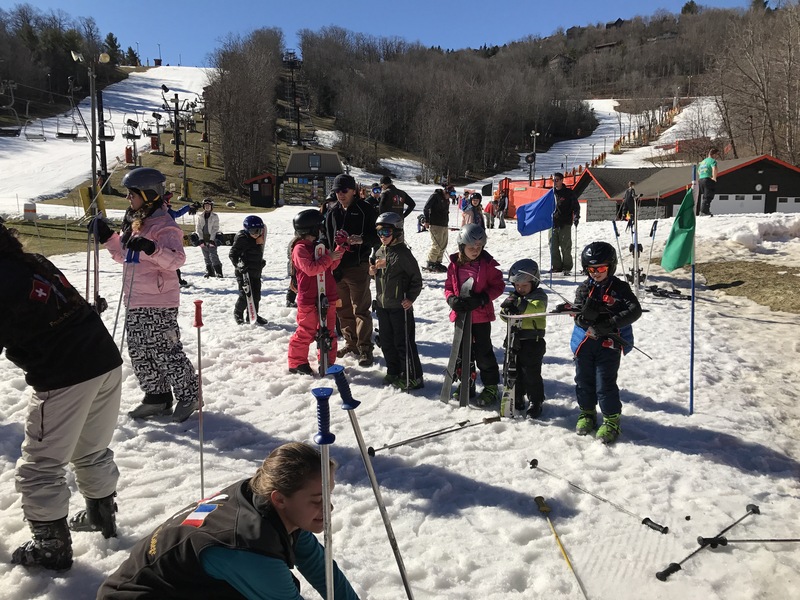 The kids skied and skied and skied. After practicing on the smaller bunny hill, they all quickly graduated to the bigger bunny hill. Faith learned how to turn while the boys just learned how to go straight down the hill and then stop. They all skied for hours until it was time for lunch. It was so warm during lunch that the kids complained about it being too hot! Crazy right? And yes, I have on a tank top in January. After eating the sandwiches and snacks that I packed that morning, we went back out to the slopes. This time, Faith wanted to go up to the bigger runs. She and Tom went a few times together and then I got my turn to ride up with Faith. I was so proud of how determined and fearless she was on skis. She did an amazing job. By the end of the day she was cruising down the blue runs. Little Miller was like Ricky Bobby in Talladega Nights, “I just want to go fast!”. He was one of those little kids that you see zooming down the slopes without turning and without any fear. He did awesome! He went up to the top with Faith and Tom over and over again. 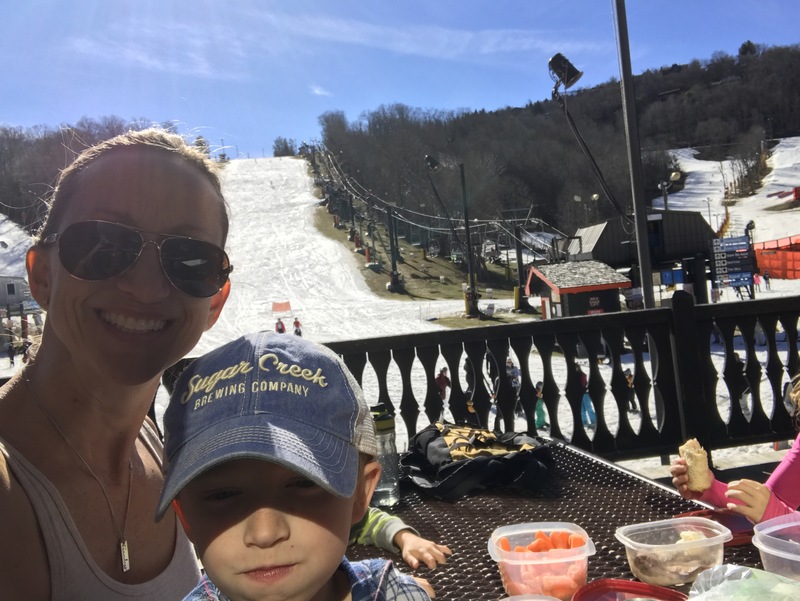 At the end of the day he cried and cried because he didn’t want to stop skiing. He especially wanted to keep his helmet and keeps asking me when I am going to buy him a helmet of his own. Wilson did a great job too (of course I don’t have a picture of him skiing). Wilson is usually somewhat fearful of going fast (which seems so unlike him), but he liked going fast down the bigger bunny hill. He isn’t quite ready to head to the top of the mountain but I know that he will get there soon enough. I was almost in tears yesterday thinking about how we have found a sport that we can all do together, and it is one that I truly enjoy doing. 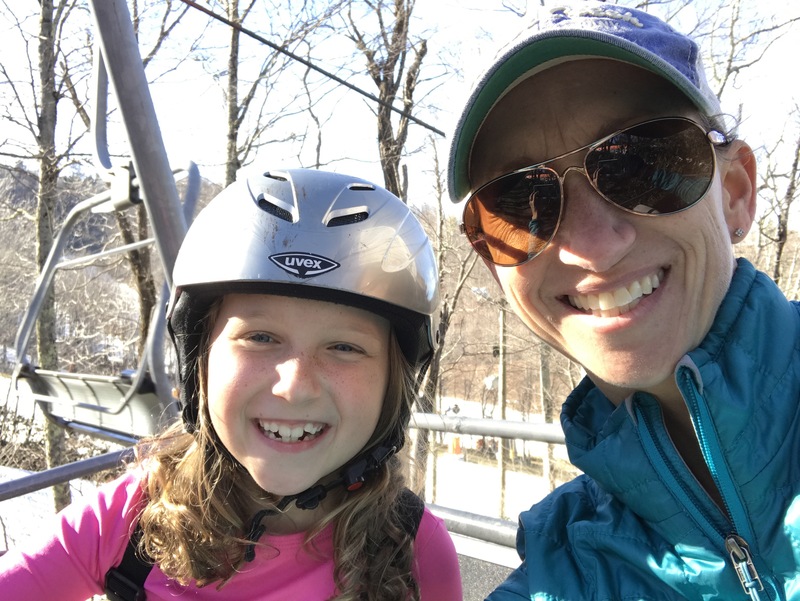 The kids will only get better and better at skiing and snowboarding as time goes on. 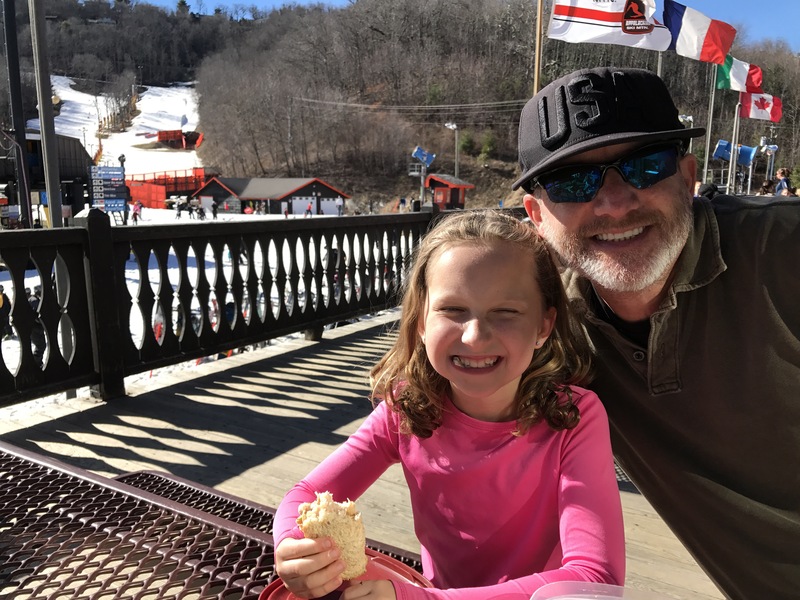 We plan to head back up to Appalachian Ski Mountain in two weeks for the next homeschool day and we are all counting down the days until we can go again. This entry was posted in Uncategorized on January 26, 2017 by Becca. 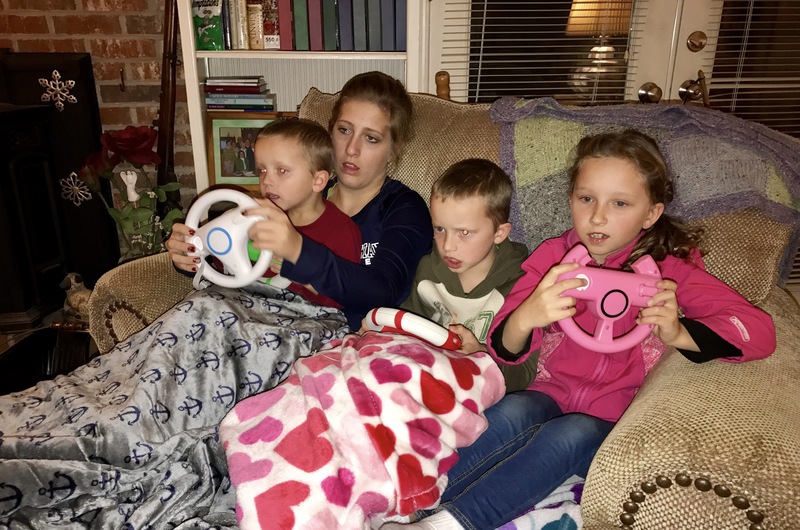 The one question that I get asked a lot is, “How is homeschooling going?”. I am very honest in my reply which is, “It is going a lot better than it was a few months ago. It was terrible in the beginning, but now we are enjoying it a lot more. We have a routine….sort of. The hardest part about homeschooling is getting work done and finding the time to do it. It is so easy to fill up the mornings with activities, art, and goofing off. I have really learned to keep the mornings free so that the kids can learn and do their work. Before I even started this adventure, I had a few veteran homeschool moms tell me not try to get in every subject everyday because it was impossible. They were right! There is no way that I can make my own children sit and do reading, writing, math, science, Bible study, spelling, handwriting, and history all in one day. Not a chance! On most days we are able to do math, history (my new favorite), spelling, Bible study and reading. If Wilson does a lot of writing that day then I don’t make him do handwriting also. It really is a juggling act. 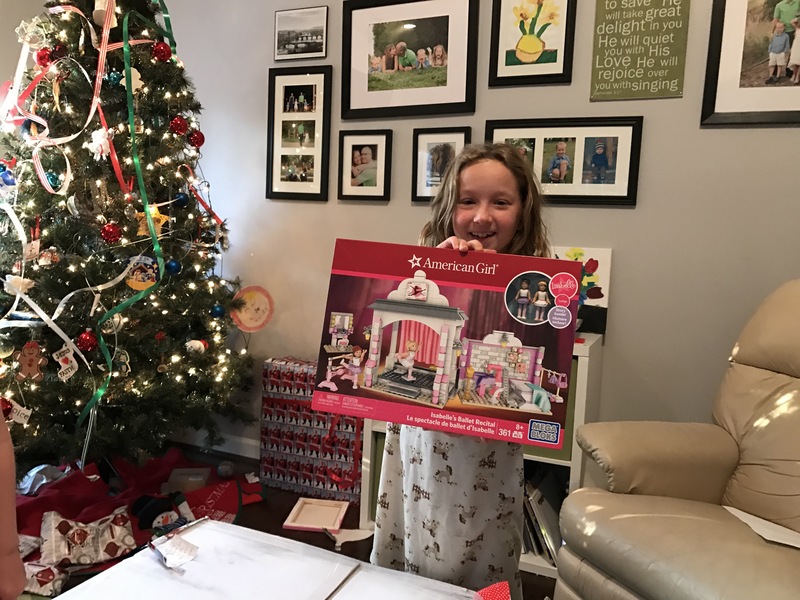 There are days that I feel successful, and other days when I feel like a total failure and that I am ruining my children. I am constantly tweaking the process and making it better. For example, I have realized that on Tuesdays, when Miller is home, I need to make the learning more fun and interactive. Tuesdays are the days to do a science experiment, an art project, bake cookies to learn fractions, or read aloud from our history book and color in a map. It is a day for a math game or watch to our Times Tales DVD to help learn times tables (which is a fabulous way to teach your visual learners). 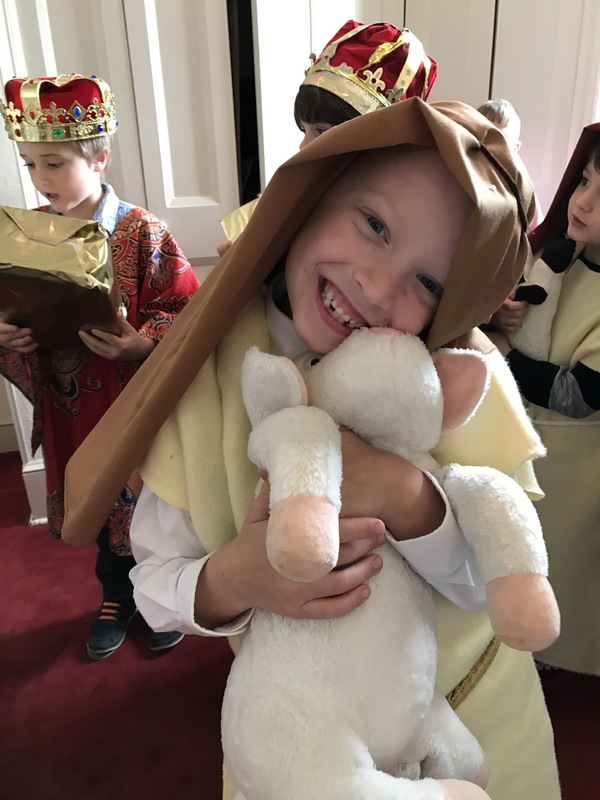 There are ways to make learning more fun and interesting in order to keep a 4…I mean, a 5 year old entertained. (Boo-hoo! Miller had a birthday). I still love being at home with the kids. Our lifestyle has slowed down significantly and that is the way I would like to keep it. I think that the kids enjoy being at home more often as well. Wilson still needs some friends, which we are working on, but even he would rather be at home in his pajamas than getting up early and going to school all day. Overall, life still has its challenges, but it is better. We are together more. My relationship with Faith has improved dramatically. I can learn alongside my kids and I actually know what they are learning. I know what they struggle with and what to focus on more the next lesson. We can take field trips together. Homeschooling is where God has led us and I am so very thankful. This entry was posted in Uncategorized on January 7, 2017 by Becca. 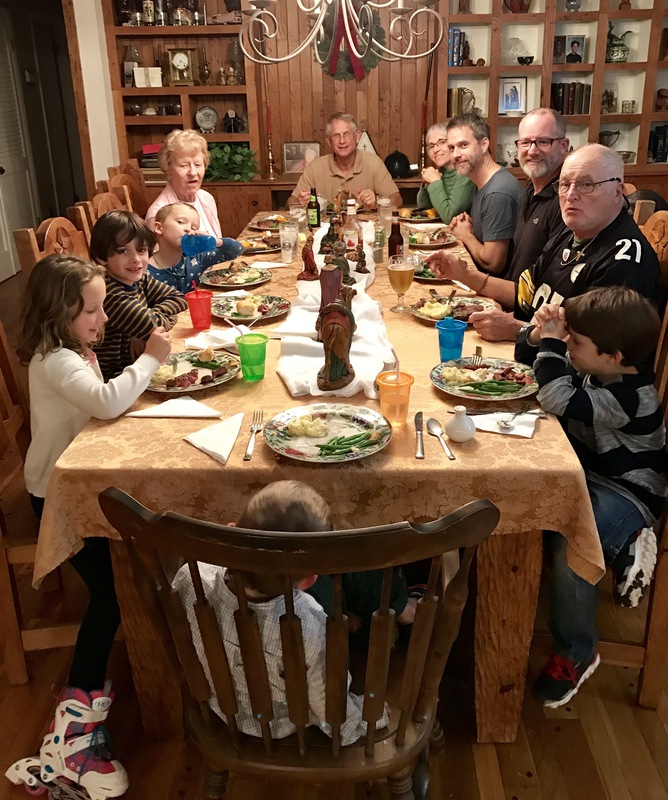 Each year we spend the second half of Christmas break in Pennsylvania with Tom’s family. We all meet up at his mom and Will’s house for a few days. One day is dedicated to having “Christmas”. 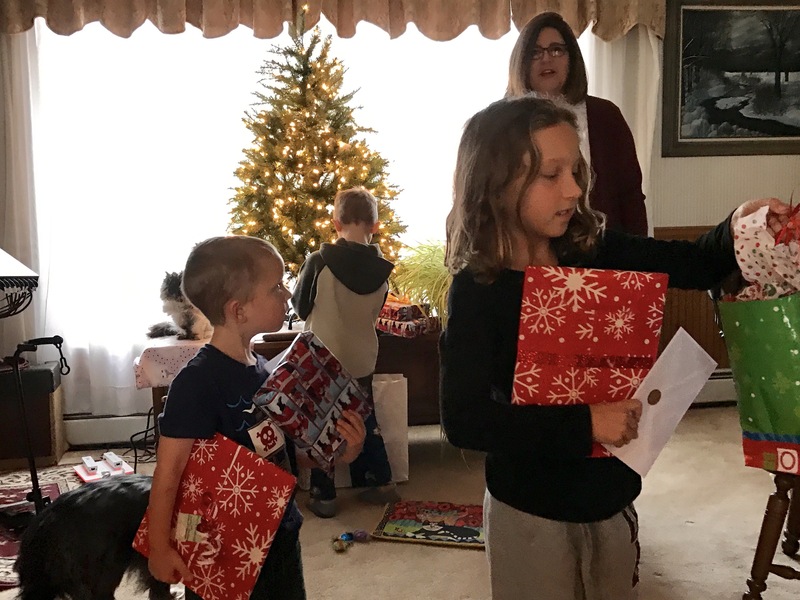 The kids get to open presents from Will, Aunt Shelly and Aunt Kim. This also gives them some games and toys to play with while we are there. Wilson got a chess set so we played a lot of chess over those few days. He beat us most games. We also like to bring the Wii for the kids and Alexis to play (of course, we have to play some too.). This keeps my kids entertained so that they don’t sword fight in the house or jump all over the furniture. Technology definitely has it benefits and uses…..
One thing that we did differently this year was to go to trivia at Al’s pizza where Shelly was hosting the trivia that night. I love trivia night and everyone seemed to enjoy it as well. It was fun to go out together and have something to rally around. We invited Tom’s cousins, Jenny and Mike, to go with us. They came in handy when there was a matching question about ten famous law cases, since they are both lawyers. Yep! We won first place….which wasn’t too hard since we had two lawyers and Will on our team…and there were only four teams playing that night. BUT, we still won! The icing on the cake was the snow. We woke up the first morning to an inch of snow on the ground. An inch of snow isn’t much to most, but to us, it is as good as a foot. 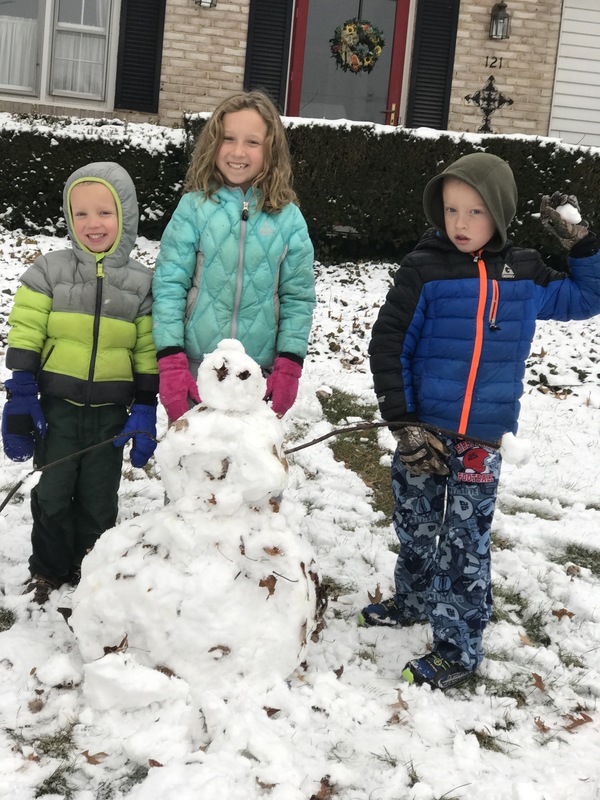 The kids bundled up and rushed out to build a snowman. 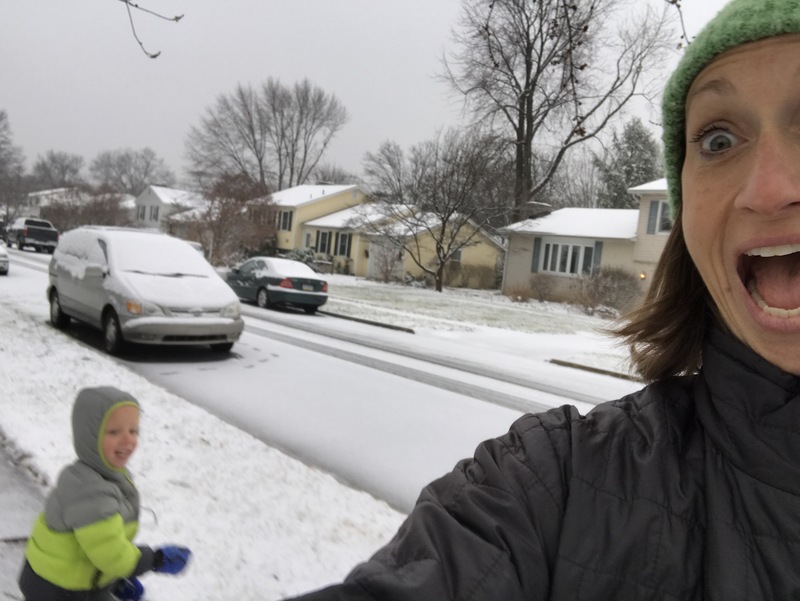 I was thankful that Tom grabbed some mittens at the last minute before we left our house back in NC. I was the target of most of the snowballs…. It is always fun to see Tom’s family. We may not get to see them as often as we see my family, we always has a great time together. Will is always such a gracious and patient host. He lets us completely invade his quiet home and never complains about the mess or the noise. Thanks Will! This entry was posted in Uncategorized on January 3, 2017 by Becca. I was just as excited as the kids were to begin Christmas break. We only did a few subjects during December anyway, but i needed a mental break from teaching. We ended school on December 21st, the day Doug and his boys arrived. 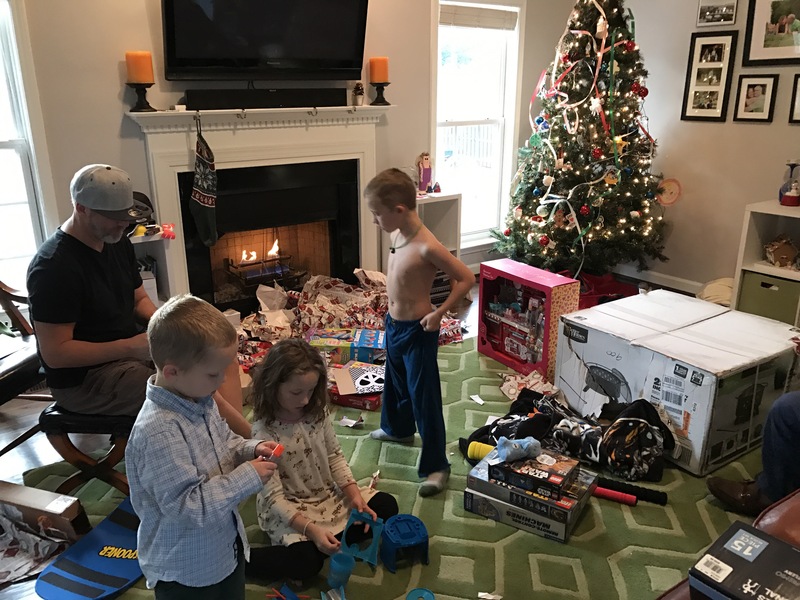 Here is a quick glimpse at all of the Chrismas fun…. 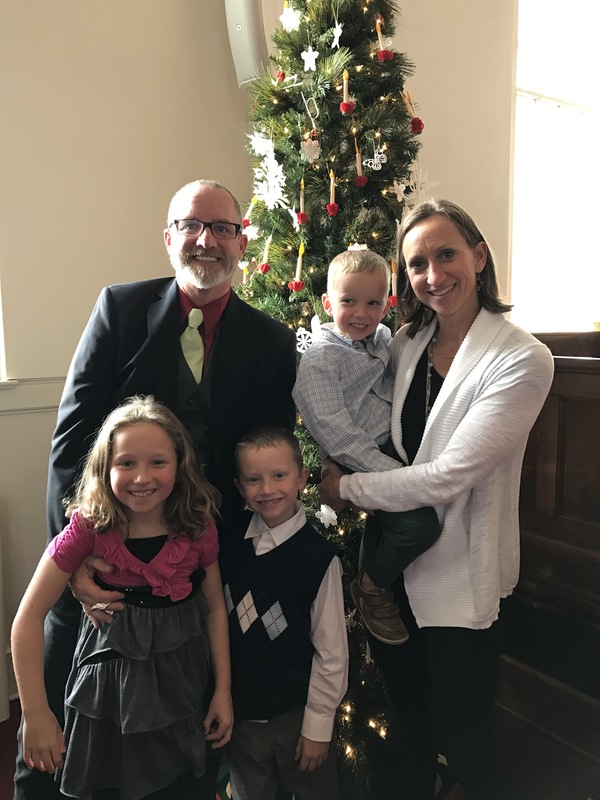 We spent Christmas Eve at Little Church, ate some Love Feast buns, sang songs, and got our family picture next to the Christmas tree. 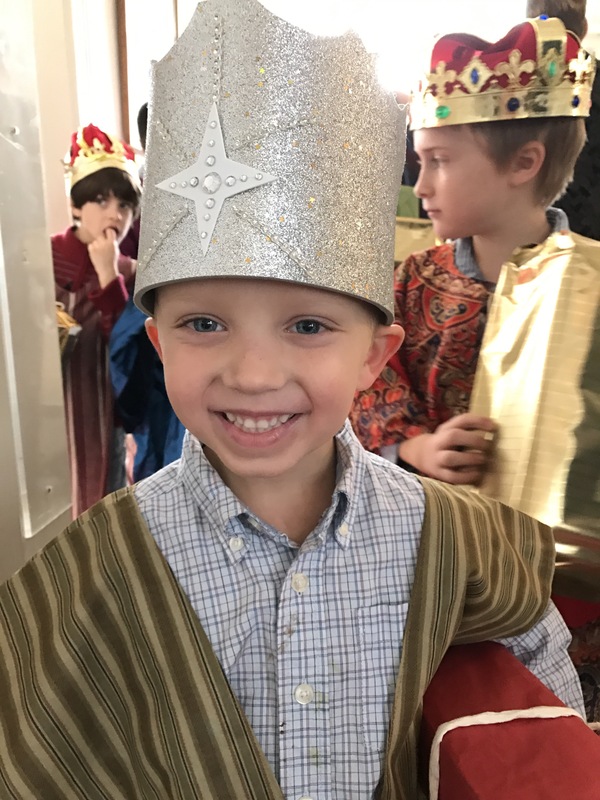 Of course, the kids had to be in the Christmas play at church. My sweet Wise Man…. Next we made some art. After Gabriel found out that I made Jackson Pollock splatter paintings with my kids he wanted one as well. 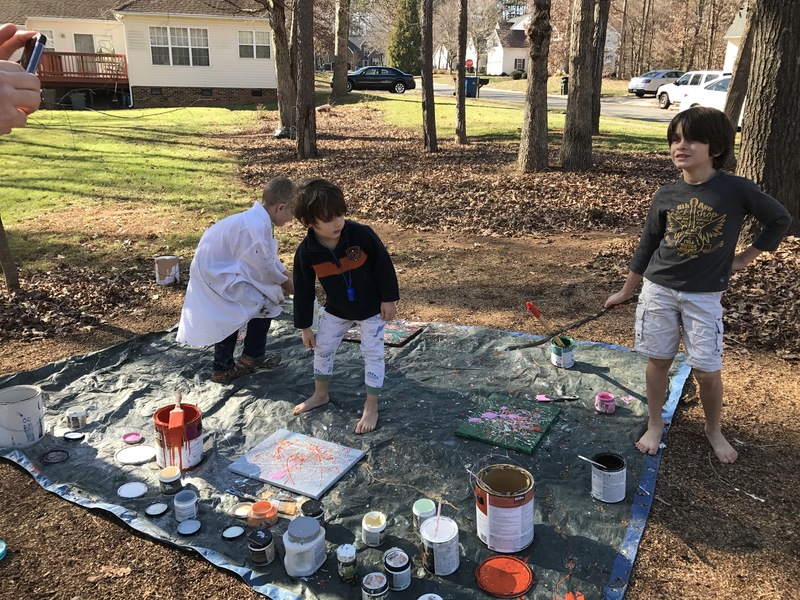 Being the awesome aunt that I am, I went to Michaels to buy more canvases, pulled out the tarp and paints again, and let the kids make another huge mess in the front yard (I still haven’t posted about us splatter painting the first time yet. Oops). 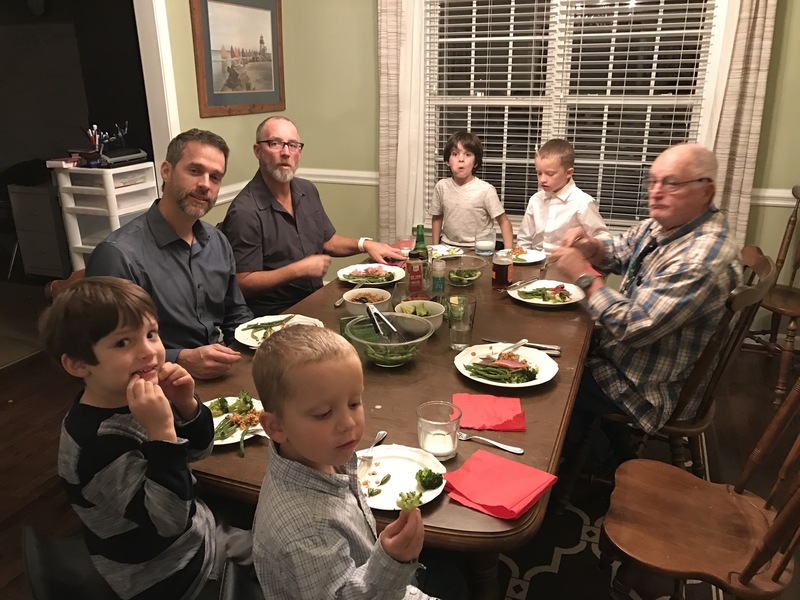 Doug and his kids stayed with us for Christmas eve dinner…..
Christmas morning was full of excitement. Wilson woke up at 4:00am and began to open his stocking that we hung on his bed. Thankfully, he woke me up to say “thank you” and I promptly put him back into bed. 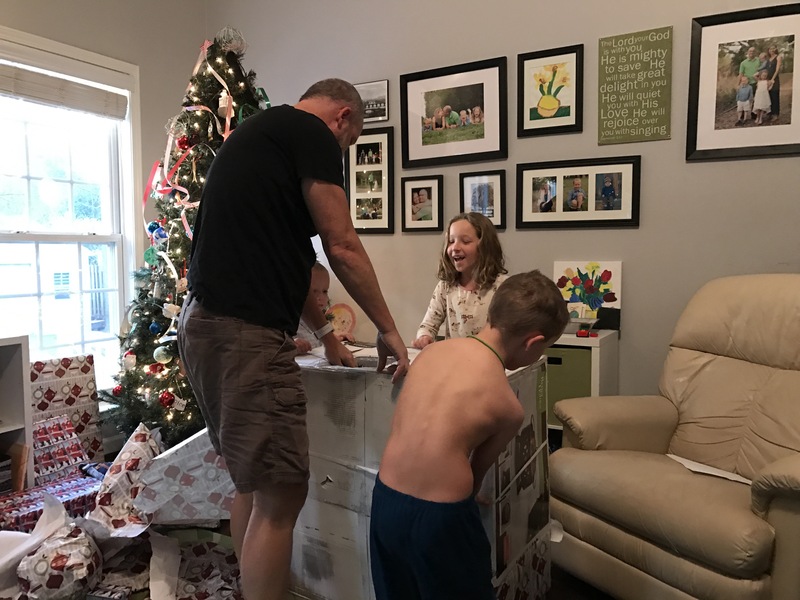 Tom and I finally got up around 8:00 and went to open presents with the kids. Miller and his three gifts. Miller would be perfectly content with any gift that he received. 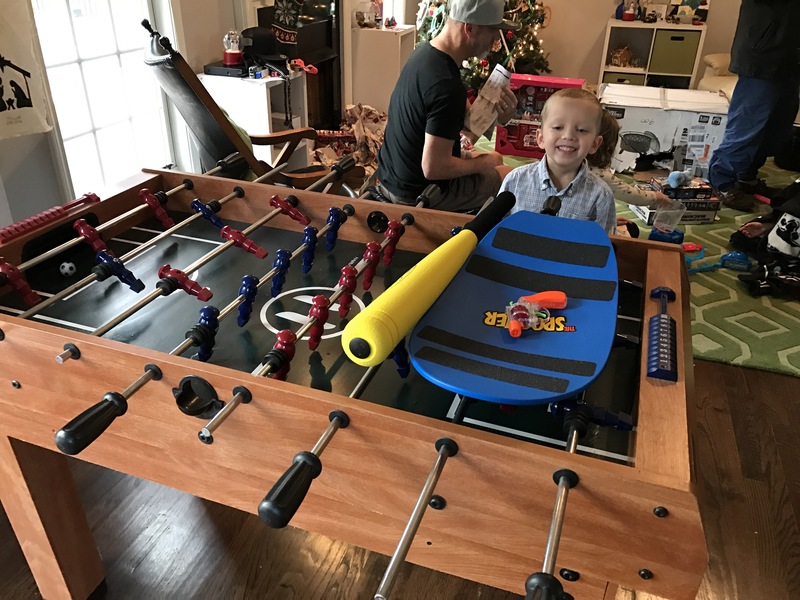 This year our neighbor offered to give us his old fooze ball table which we in turn gave to Miller for Christmas. He loved it! After unwrapping presents, we headed over to my Aunt Lisa’s house for our usual brunch. This is one of my favorite holiday traditions. At 10:00am we stop what we are doing, get into the car with our pajamas still on, and go to eat breakfast with our Charlotte family. I love it! 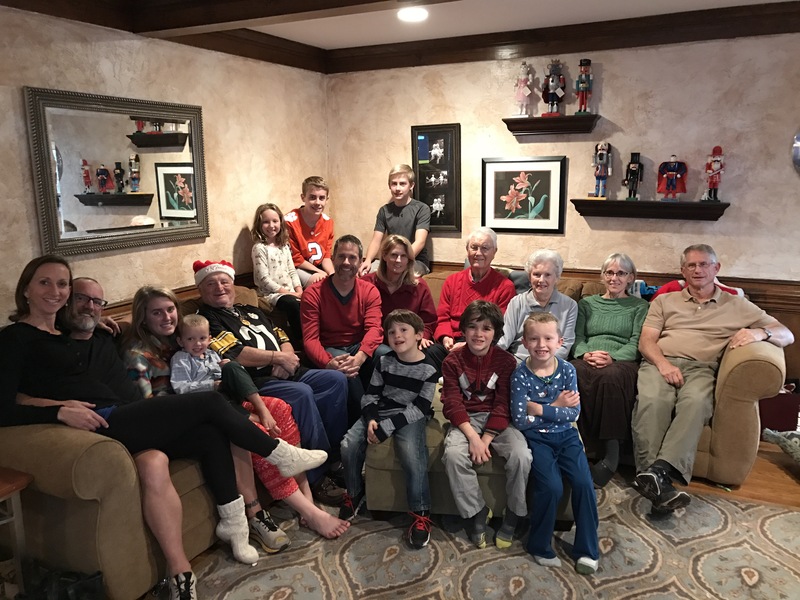 Here is the whole gang (Toms dad was taking the picture)….. Believe it or not, but later on that day we all got together again at my parents’ house for dinner. It was the longest 24 hours, and I was exhausted by the end of the day, but I felt so blessed. I truly have the most wonderful and supportive family. I know that I am loved by them and it is easy to see that we enjoy being together. I went to bed that night thanking God for his many blessings. This entry was posted in Uncategorized on January 1, 2017 by Becca.